Deltaville, famous for its water-sports and other bayside activities, is adding a 5K Run to its list of fun things to do. Register now and join other runners during Deltaville’s annual Heritage Day festivities on July 2nd, for an exciting run through the town. 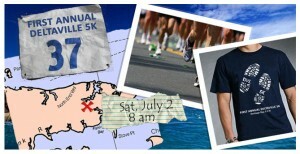 The course will take you to the water, where you’ll even run on a pier, giving you a view of the Bay! So soak in your celebrity status as spectators cheer you on from start to finish and be the first to run Deltaville’s inaugural 5K.